The Holiday House was refurnished in 2016. 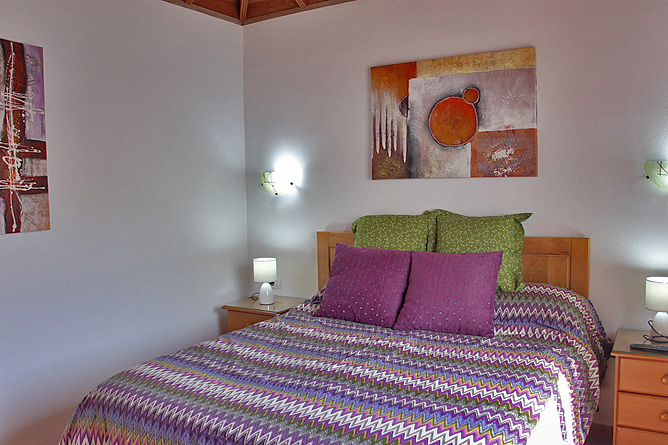 Casa Amarna is nestled on a 500m2 walled property, comprising 80m2 living space for up to 4 persons and a baby. 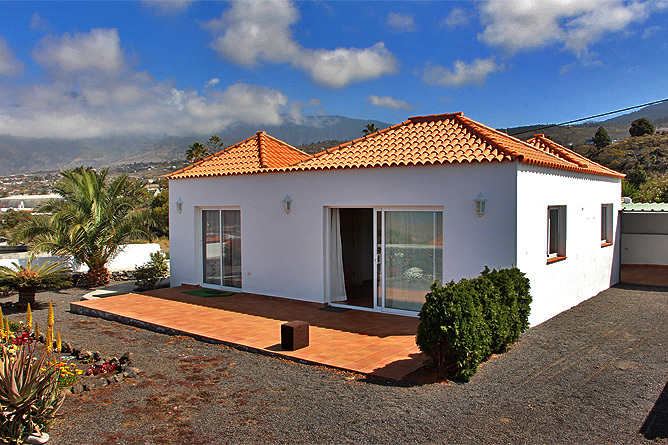 The Holiday House is located at the end of an accommodation road with no through traffic. 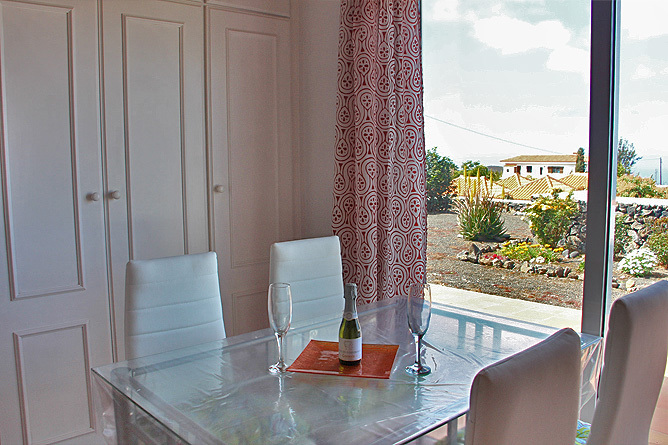 Situated between the villages La Laguna and Todoque on the sunny west side, the Holiday Home attracts many long-term guests even in winter, due to year-round pleasant temperatures. 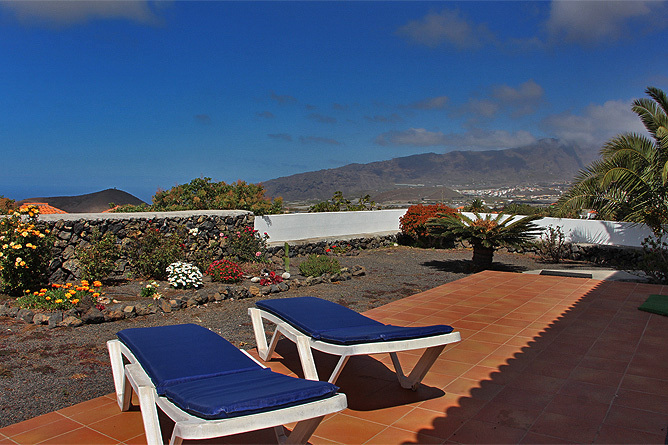 The beach of Puerto Naos and the large town Los Llanos are both within 10 driving minutes. 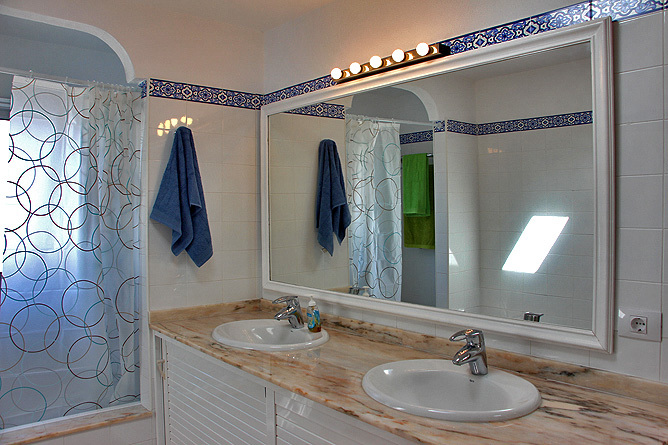 The property is completely surrounded by a wall and offers plenty of privacy. Entering through a small gate, some stairs lead right to Casa Amarna. The front garden of Casa Amarna is nicely arranged. 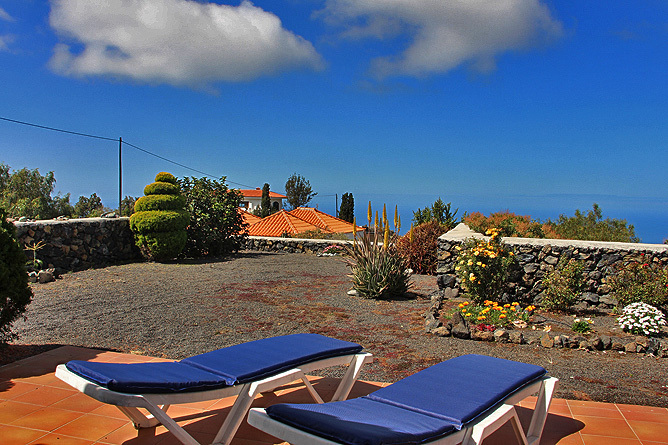 From there you enjoy a beautiful view of the sea, La Laguna and the Aridane Valley. 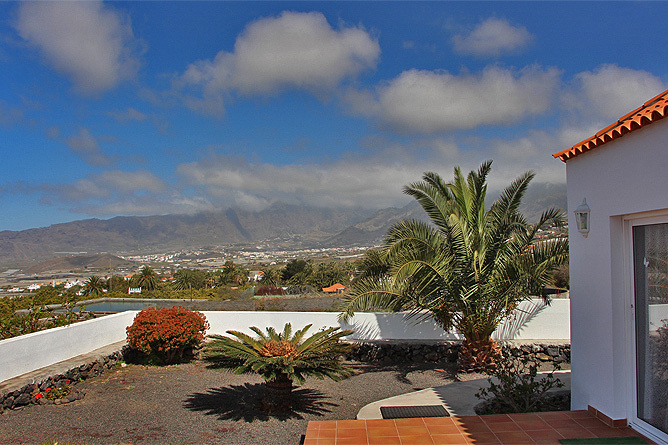 On clear days you can see the Caldera ridge as well as parts of the Cumbre Nueva in the backdrop of the house. There you find 2 loungers and a table with 4 chairs. 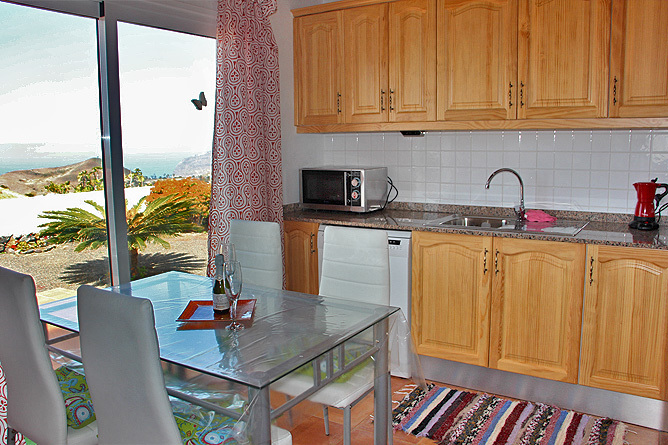 Next to the terrace you find an utility room with a washing machine. 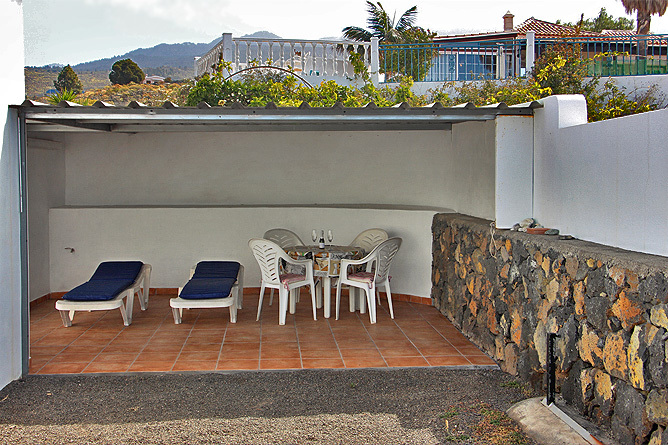 In fact, the front terrace offers space to enjoy sunbathing or a breakfast together. 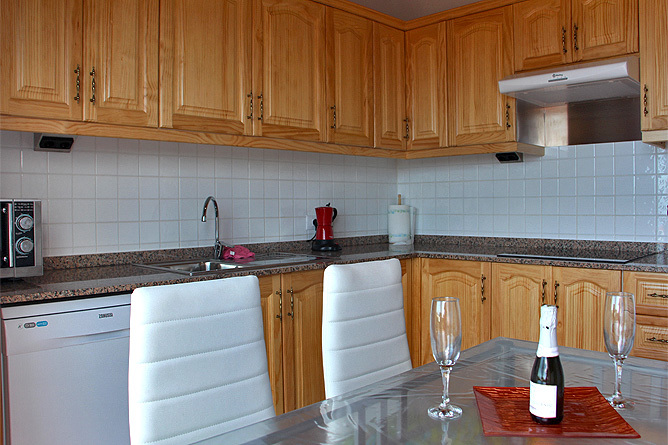 The living area as well as the separate kitchen provide access to the outdoor area. 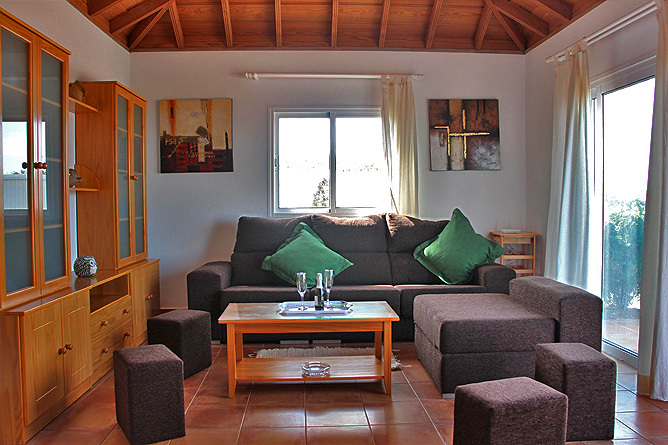 The spacious living room has a L-shaped landscape sofa with 4 small taborets. There is also a wall unit with glass cabinets, shelves and drawers for your utensils. 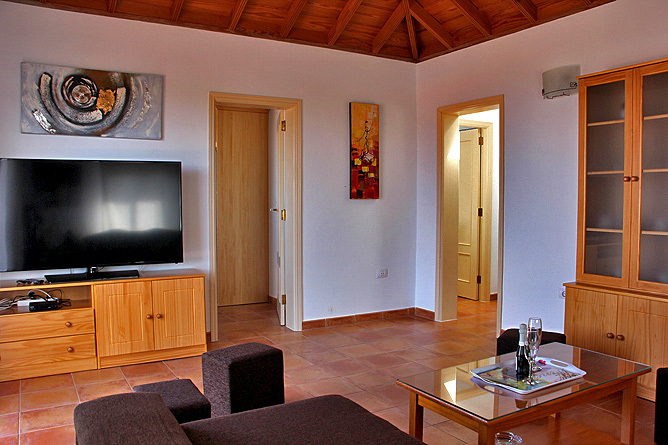 A highlight is the large, modern flat screen with a satellite TV. Large glass sliding doors connect the indoor with the outdoor area and provide a light and friendly atmosphere. Next to the living room there is a small, separate kitchen with a built-in cupboard, a dining table with 4 chairs and a well equipped kitchen corner. 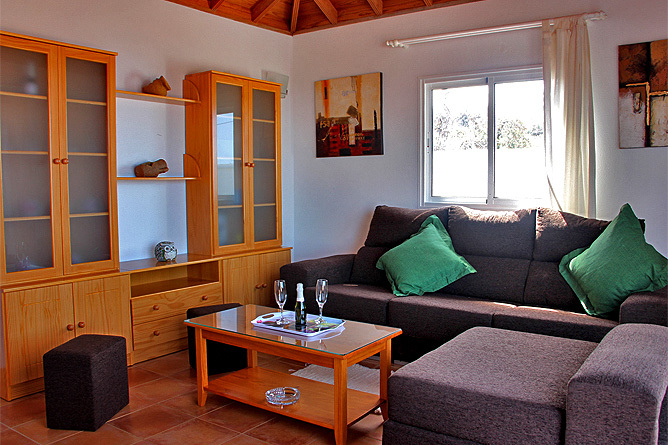 All rooms feature the typical, pointed wooden roof, offering a spacious and light ambience. 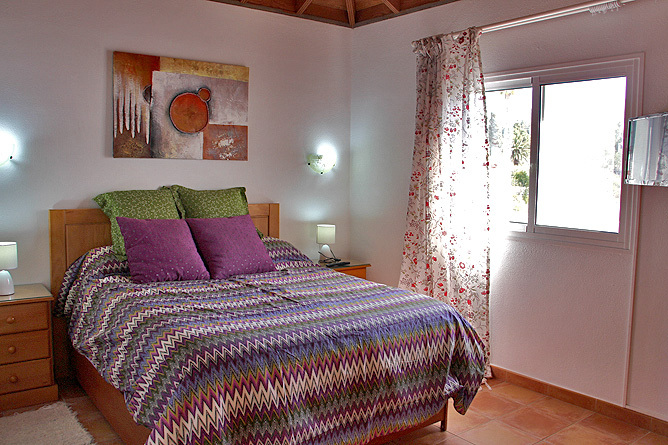 The two bedrooms and the bathroom are located in the rear part of the Holiday House. 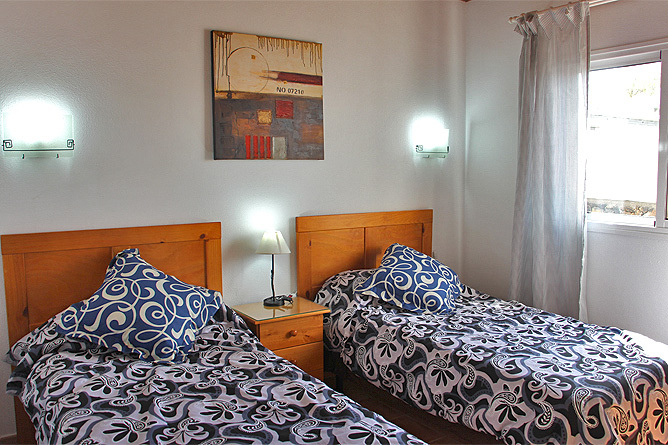 Both bedrooms have large wardrobes and offer a view of the mountains. New, high quality mattresses make sure you have a relaxing sleep. 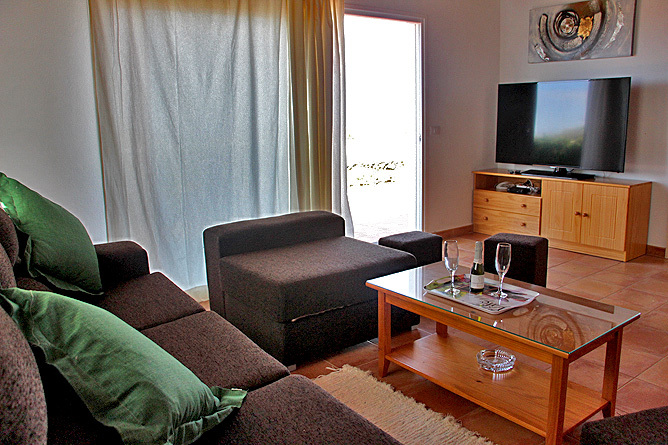 The small swivel-mounted TV in the bedroom does not offer any German channels, however, there is a USB connection so you can bring and watch your own movies. 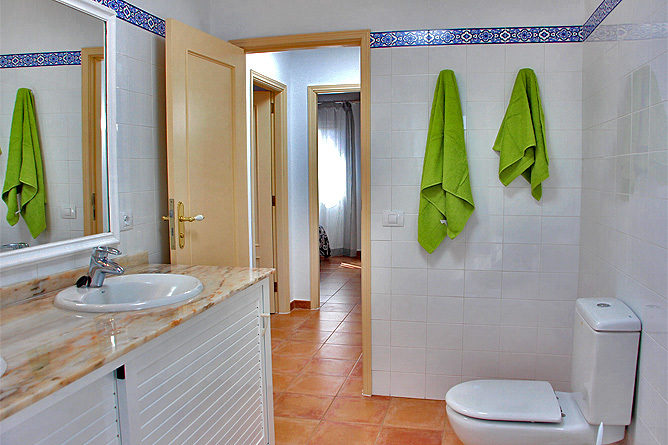 In the bathroom you find a double washbasin, mirror front and a lower cabinet as well as a shower basin, a toilet and a bidet. A rental car is indispensable. The final driveway to the house is a non-cemented dirt road, please drive carefully and go for a rental car with a strong engine. Parking in front of the house is possible. The Holiday House is almost equidistant from the two small towns La Laguna and Todoque, but also from bigger towns in the Aridane Valley, like Los Llanos and El Paso, as well as from the small port town Puerto Naos (10-15 driving minutes) and Puerto de Tazacorte with its bathing beaches (15-20 driving minutes). 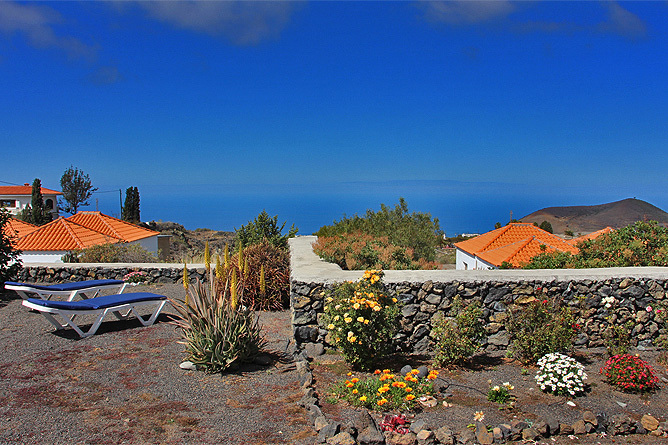 The central location of the Finca is perfectly suited for different kinds of activities: bike- and hiking routes are close to the Holiday House and after an active day you can enjoy one of the nearby beaches. Only a few driving minutes from Casa Amarna you will be invited to stroll along and enjoy a delicious Cortado (coffee) on the Plaza de España von Los Llanos. Los Llanos has many restaurants that offer dishes for all tastes. 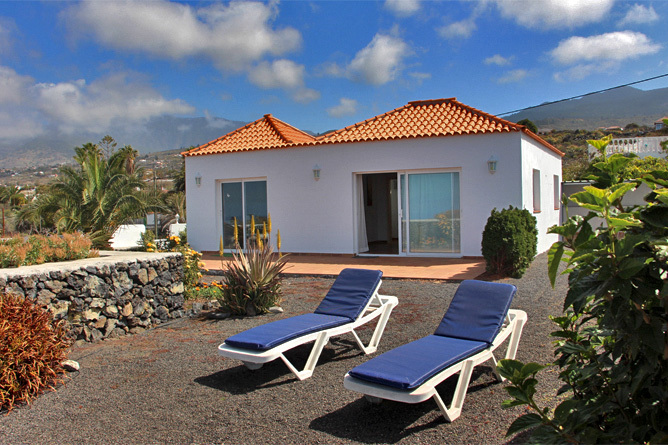 But also in the close surrounding of the Holiday House you can enjoy culinary delights, for example in Casa Kiko or in the Arepera El Rinconcito in La Laguna - both are also popular amongst local people. In Todoque you find tasty Tapas in the Altamira and in the typical Palmerian Grill Restaurant El Atajo. 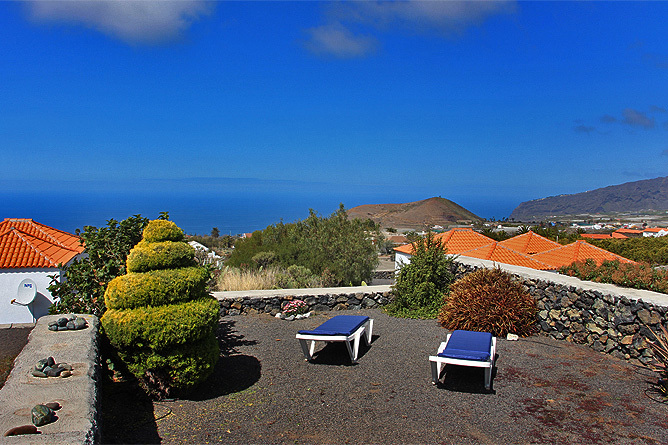 Towards Puerto Naos you find the well known restaurants Mariposa and Las Norias. Meat and fish are freshly roasted there on the grill. La Laguna has a small supermarket and a Mini-Market, that sells daily necessities. In Todoque you find a well sorted supermarket, that is also opened on Sunday noon. Large supermarkets and organic markets are in Los Llanos and El Paso. Friday afternoon and Saturday noon there is a weekly market in El Paso, where you can buy fresh fruits and vegetable as well as other typical products of the island. The market hall in Los Llanos is opened daily. Holiday Bungalow with Sea View and central location on the west side of La Palma in the area of the village La Laguna.